Engineered Electronic Products, Innovative Designs and Technology! Warning: This product can expose you to chemicals, including DIISONONYL PHTHALATE (DINP), which is known to the State of California to cause cancer. For information visit California's Goverment information page: www.P65Warnings.ca.gov or Calrad's information page: California Proposition 65. 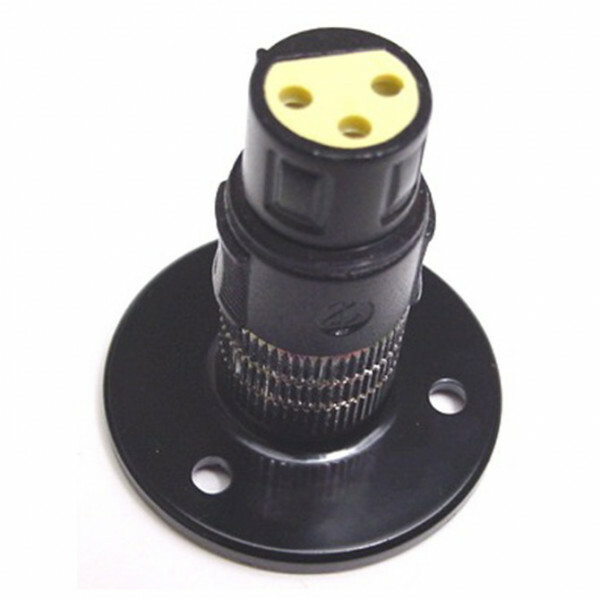 30-590 | Female XLR desktop mount in, used for quick release style gooseneck mics. Removable solder type Female XLR. Mounts with 3 screws included. Base dia. 1.75”, height 2”. For U.S.A, On Orders Over $25. Click Here for > More Info. Calrad Electronics has been in the same family ownership for over 60 years. Many of our employees have been with the firm for 25 or more years. Many of our customers have been buying from Calrad for even longer than that. Our manufacturers and suppliers in Asia have known and trusted Calrad for generations. It all started in the 1950’s . . .
© Copyright 2019 by Calrad Electronics. All Rights Reserved.